Hair Regrowth Treatment for Women. 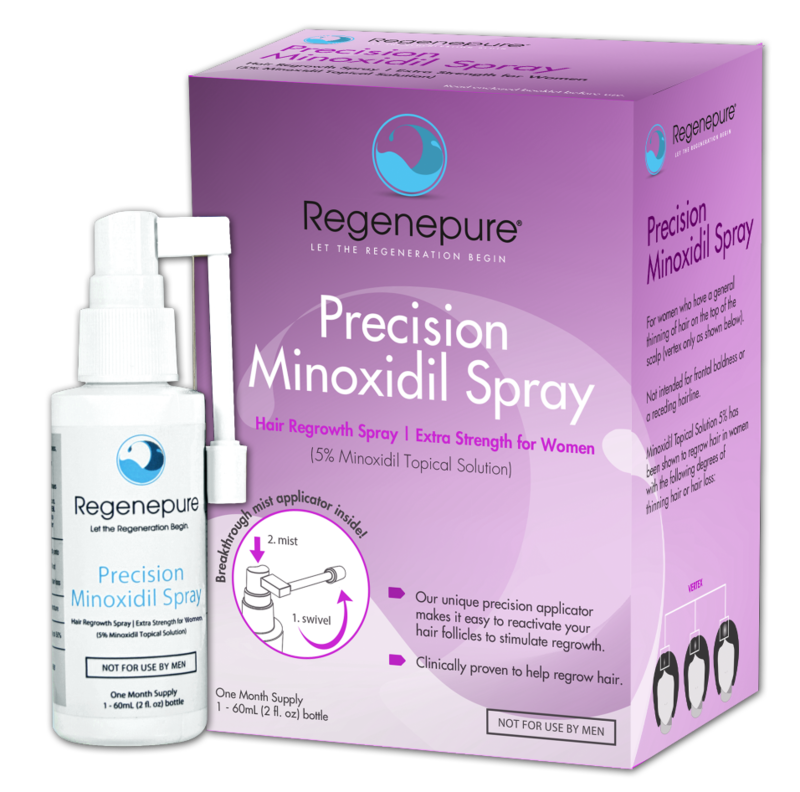 Regenepure Precision 5% Minoxidil Spray for Women contains the only clinically-proven and FDA approved topical ingredient to treat hair loss and regrow hair in women. The breakthrough precision mist applicator includes a pivoting nozzle that delivers the 5% minoxidil solution directly into the scalp in the hair loss area. Recommended for women with hair loss or thinning hair. Works with any hair type, length or texture. For optimal results, use in conjunction with the full Regenepure line. Warning: For external use only. Avoid contact with eyes. If eye contact occurs, rinse immediately with clean water. Keep out of reach of children. Ask a doctor before use if you have heart disease. Is 5% Topical Minoxidil More Effective Than 2% Topical Minoxidil in Treatment of Female Hair Loss? In a 48-week, double-blind, placebo-controlled, randomized, multicenter trial compared the efficacy and safety of 5% topical Minoxidil with 2% topical Minoxidil and placebo in the treatment of female pattern hair loss. Topical Minoxidil solution 2% stimulates new hair growth and helps stop the loss of hair in men with androgenetic alopecia and women with female pattern hair loss. Results can be variable, but historic experience suggests that higher concentrations of topical Minoxidil may enhance efficacy. In this clinical study of 381 women (ages 18-49) with female pattern hair loss, at week 48, the 5% topical Minoxidil group demonstrated statistical superiority over the 2% topical Minoxidil group in the patient assessment of treatment benefit. Both concentrations of topical Minoxidil were well tolerated by the women in this trial without evidence of systemic adverse effects. with androgenetic alopecia if used under their supervision. Some small clinical trials have been conducted on 5% minoxidil for androgenetic alopecia in women showing that indeed the 5% solution is significantly more effective in both retaining and regrowing hair than the 2% solution. The efficacy of this treatment method vary from person to person, but many women have found that using the 5% minoxidil treatment have made a positive difference in their hair and their self-esteem. Regenepure 5% Minoxidil Spray for Women is formulated for women’s use only. Additionally, this hair loss treatment will help women who suffer from androgenetic alopecia to retain and regrow hair. One of the benefits of this breakthrough spray treatment, vis-a-vis droppers and foams, is that it delivers the solution directly onto the scalp with no mess. The fine mist applicator ensures absolute accuracy, targeting thinning areas with ease. The direct contact spray will also help provide the scalp with the oxygen and nutrients it needs to stimulate healthy hair growth and regrowth. It is also important to note that the Regenepure Precision 5% Minoxidil Spray works best when used in conjunction with the Regenepure DR Hair and scalp treatment shampoo, to help cleanse and detoxify hair follicles; allowing for optimal minoxidil absorption. Minoxidil is a vasodilator that allows more nutrients, oxygen and blood to reach the scalp. When applied once a day, 5% topical minoxidil is able to re-awaken and re-energize the dormant, atrophied hair follicles thus producing new hair growth where there was none and promotes thicker strands where the hair strands are thinner and weaker. When minoxidil for hair loss is first applied, it is not uncommon to experience a shedding phase where these thin, fragile hairs fall out. Following this initial period, the new hair growth may look like peach fuzz and be very soft. These baby fine hairs are exactly that – the first hair babies grow on their head which eventually turn into the regular, thicker hair we have as adults. Minoxidil for hair growth does require continual use to keep these re-invigorated follicles from going back to a less productive state. If usage is discontinued, the growth may cease and the regrown hair will likely fall out however, minoxidil does not cause hair loss in areas of normal hair growth prior to use. Regenepure 5% Minoxidil Spray for Women is the best of minoxidil product because of its unique and convenient swivel applicator and its extra strength concentration. Warnings: For external use only. Flammable: Keep away from fire or flame. DO NOT USE if: your degree of hair loss is different than that shown on the side of this carton, because this product may not work for you; you have no family history of hair loss; your hair loss is sudden and/or patchy; your hair loss is associated with childbirth; you do not know the reason for your hair loss; you are under 18 years of age. Do not use on babies and children. Do not use if your scalp is red, inflamed, infected, irritated, or painful or if you use other medicines on the scalp. Ask a doctor before use if you have heart disease. When using this product do not apply on other parts of the body, avoid contact with the eyes. In case of accidental contact, rinse eyes with large amounts of cool tap water. Some people have experienced changes in hair color and/or texture it takes time to regrow hair. You may need to use this product once a day for at least 3 months before you see results. The amount of hair regrowth is different for each person. This product may not work for everyone. Stop use and ask a doctor if chest pain, rapid heartbeat, faintness, or dizziness occurs sudden, unexplained weight gain occurs, your hands or feet swell, scalp irritation or redness occurs, unwanted facial hair growth occurs, you do not see hair regrowth in 3 months May be harmful if used when pregnant or breast-feeding. Keep out of reach of children. If swallowed, get medical help or contact a Poison Control Center right away. Other Information see hair loss pictures on side of this carton before use, read all information on carton and enclosed insert. Keep the carton, it contains important information. Store at controlled room temperature 20° – 25°C (68° – 77°F). Keep tightly closed. Apply one ml. (6 sprays) once a day directly onto the scalp in the hair loss area. Using more or more often will not improve results. Continued use is necessary to increase and keep your hair regrowth, or hair loss will begin again. Wash hands thoroughly after use. Remove the bottle of Regenepure Precision Minoxidil Spray from the carton. Remove the cap from the Minoxidil bottle and replace with the sprayer. Remove the clear cap from the pump and the sprayer cap from the end of the sprayer arm. Hold the bottle upright and swivel the sprayer arm to a horizontal position. To ensure delivery of a full dose of minoxidil you must prime the sprayer by first pointing it away from you and pressing the pump 3-5 times. Be careful not to inhale the mist. Aim the sprayer at your area of thinning hair or hair loss area and pump the sprayer 6 times to apply an even 1 ml dose once a day. After applying Regenepure Precision Minoxidil Spray, replace both caps and swivel the sprayer arm back to a vertical position before putting the bottle away. To prepare your scalp for the full benefits of using RegenePure Precision Minoxidil Hair Loss Spray, we recommend that you shampoo with RegenePure DR and RegenePure NT. For external use only. Avoid contact with eyes. If eye contact occurs, rinse immediately with clean water. Keep out of reach of children. Ask a doctor before use if you have heart disease.